Once upon a time there was something called “The New Journalism”, a type of non-fiction that developed during the 1960s among writers as different as Hunter S. Thompson, Gay Talese, Jimmy Breslin, Joan Didion, Truman Capote, Norman Mailer and Tom Wolfe, and which endeavored to use the tools of fiction to write non-fiction. Which used scenes instead of narrative to tell the story, relied on dialogue and conversation as opposed to isolated pull quotes, and which put a very distinct and acknowledged point-of-view front-and-center. And while there are arguments about where it started, few will dispute that Tom Wolfe was one of the earliest practitioners and that this selection of his earliest essays represent some of the first forays into it. The 22 pieces collected here originally ran in “Esquire”, “Harper’s Bazaar” and “New York” in the early 60s and cover everything from California’s custom car culture to Las Vegas to Phil Spector to Junior Johnson and beyond. As a result, it is Wolfe’s distinctive (though here, nascent) style that ties the book together. A style that uses onomatopoeia, sound effects, creative punctuation, wordplay, obscure vocabulary and purple flights of linguistic acrobatics to tell his stories. That said, you may read them and wonder what the big deal was, now that these have become the common currency of non-fiction writers across the spectrum. But such is the fate of pioneers; by the time the rest of us take the freeway out to the frontier we wonder what all the shooting was about. And yet it’s still possible to see how New Journalism was to journalism what the creative revolution was to advertising: an utterly new voice. Just as “Think Small” didn’t sell cars the way other automobile advertising did, the title essay “Kandy Kolored Tangerine Flake Streamlined Baby” didn’t talk about cars the way they’d been talked about before. But New Journalism was like the creative revolution also because it really only worked when it was backed by solid thinking, solid ideas, solid strategy. Wolfe, Talese, Didion, Thompson, Breslin and the rest all prided themselves on their newspaper skills, on their endless and tireless legwork. They were serious reporters – they just wrote differently for a different audience. Which meant that also like the creative revolution, the New Journalism was easily discredited by less scrupulous practitioners who weren’t as dedicated, who lacked their integrity, who played fast and loose with the facts, or who didn’t play with facts at all. Curiously, two of the most famous examples of New Journalism almost did not get written at all. Wolfe couldn’t figure out how to write “Kandy Kolored” from his notes and in desperation composed a long letter to Byron Dobell, his editor at “Esquire” magazine, explaining what he’d seen. Dobell removed the “Dear Byron” and ran the letter as the article. And Hunter Thompson, unable to construct the essay that would become “The Kentucky Derby is Decadent and Depraved”, ultimately ended up tearing pages from his notebook and faxing them directly to his editor, Jann Wenner at “Rolling Stone”, who too ran them more or less verbatim. And you have to ask yourself why? Both men were serious journalists who had written for newspapers and magazines for years. Why did their failure to do what they had done hundreds of times before yield something so breathtakingly original? I think it’s because they were at a moment in history when what they were observing could not be said in the ways they had been trained to say it. The form was no longer adequate to convey the content, and they had to make a kind of quantum leap in order to find a new form. And that form was New Journalism. The essays in “The Kandy-Kolored, Tangerine Flake Streamlined Baby” are, therefore, exciting, because they show a writer struggling to find the new form for that new content. Content that Julian Koenig would wrestle with at DDB, that Joan Didion would wrestle with in LA, that Ernie Kovacs would wrestle with on television, that Richard Pryor would wrestle with in comedy clubs and that others would wrestle with in hundreds of ways. But it’s exciting not merely as a historical document. It’s exciting for anyone who is writing right now, because we are living through a similar time ourselves. Content has broken the forms. The center, as it were, will not hold. Blame it on technology. Blame it on globalization. Blame it on generations past, present and future. Blame it on whatever you want to. But recognize it for what it is. And then go out and find the new form. 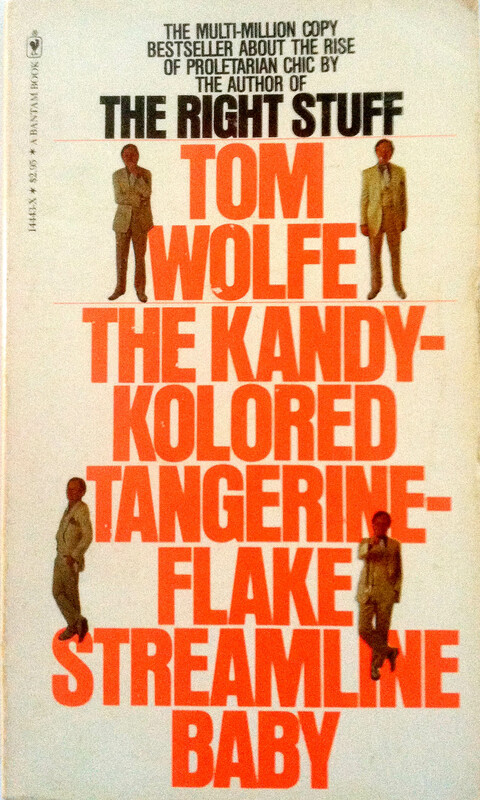 The Kandy-Kolored Tangerine Flake Electric Streamline Baby by Tom Wolfe was originally published by Farrar Straus Giroux in 1965 and more recently by Picador on 11/24/09 – order it from Amazon here or from Barnes & Noble here – or pick it up at your local bookseller (find one here).